This Malalin Bonnak movie page contains 4 records. 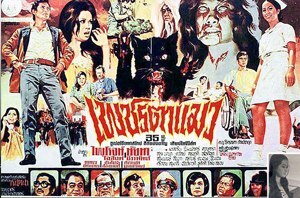 ยมบาลเจ้าขา (1971) is a Thai movie, which was never released in any format (VHS, VCD, DVD). An extract of 54mn can still be seen despite the whole remaining footage is around 1h40mn. It is a 16mm movie so no original sound is available as such movies were dubbed. There is no more poster available. ยมบาลเจ้าขา is a horror movie with a comic twist. Most former Thai horror movies have more comedy than real horror (หนังผีตลก). While her husband is away, Petchara Chaowarat is aggressed and raped by Sawin Sawangrat so she gets suicide. Daonoi (ดาวน้อย ดวงใหญ่), Sithao, Lor Tok are playing comic characters. They are aware Petchara is dead. Two other veteran actresses are involved in this movie, i.e. Malalin Bonnak (มาลาริน บุนนาค) and Charuwan Sawirayong (จารุวรรณ สวีรวงศ์), spouse of Mitr Chaibancha. It was her first movie. Charuwan Sawirayong was married to Mitr Chaibancha from 1959 to 1963. The movie scenario is a bit similar to Mae Nak story. All know Petchara has died except her own husband Kwanchai Suriya. Kwanchai Suriya (ขวัญชัย สุริยา) is a new actor and part of the numerous tentatives to find a proper candidate to replace superstar Mitr Chaibancha, who unfortunately died in year 1970. Kwanchai Suriya was quite shy when acting so he only played 2 movies as main actor and then only secondary roles. When Kwanchai realizes his wife is now a ghost (รู้เป็นผี) so he flees from his home but Petchara is still looking for him. Sawin is back from Bangkok with a man and they do visit a cemetery with a spirit doctor (หมอผี). It is a fiasco. Meanwhile Kwanchai and his friends also hire a spirit doctor. As Petchara ghost refuses to be born again, it is imprisoned in an earth clay pot. Many spirit doctors (หมอผีแขก, หมอผีจีน, หมอผีไทย) intervene but fail to control the ghost. Following all the deaths, Kwanchai agrees to go with Petchara ghost to stop the killings. He gets estranged and both go to hell judgment. The hell king refuses to accept Kwanchai as it is not his time to die yet. Before leaving, the Hell King shows him around. It features two songs in the Hell Kingdom. Through a touching song, Petchara tries to convince the Hell guardian but to no avail. Finally Kwanchai is sent back to earth but all his friends believe he is a ghost too! The movie ends with Kwanchai convincing them that he is still alive. The movie features a total of three songs.